In a medium bowl, whisk together 1/3 cup confectioners’ sugar, flour, and cornstarch. In a large bowl, beat butter and flour mixture with a mixer at medium speed until fluffy. Divide dough into quarters, and roll each portion into a 2-inch-diameter log. Wrap each log in wax paper, and refrigerate for at least 6 hours. Preheat oven to 350°. Line baking sheets with parchment paper. Remove from refrigerator, and let stand for 15 minutes. Cut dough logs into 1/4-inch-thick slices, and place on prepared pans. Bake for 10 minutes. Let cool on pans for 5 minutes. Remove from pans, and let cool completely on wire racks. In a medium bowl, beat cream cheese, vanilla, food coloring, and remaining 1 cup confectioners’ sugar with a mixer at low speed until smooth and creamy. 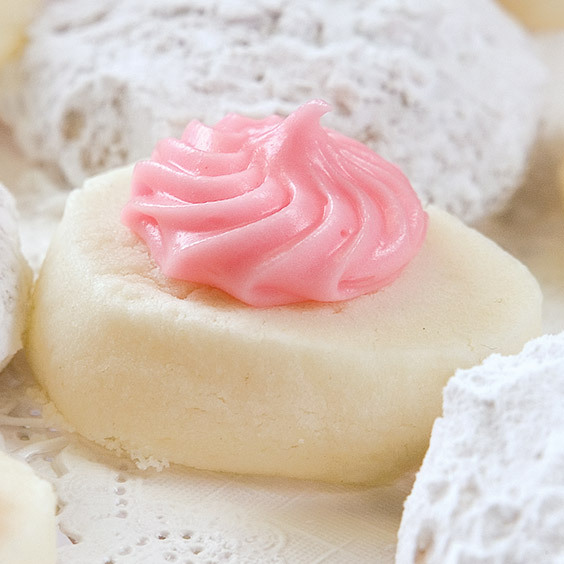 Spread or pipe frosting onto cooled cookies. Store in airtight containers for up to 2 days.